A well made pizza is a treat. A crisp crust and delicious and flavorful toppings are accented by creamy, melted, bubbling, and browned cheese. The very browned, or almost burned spots are called "blisters" and add to the pizza's appearance; select the best cheese to use on your homemade pizza that combines all of these attributes. Cheese used on pizza must meet a few criteria. It must melt well, stay soft and creamy as it melts, it should brown well, but not too much, it should form brown spots, be elastic so strings form as you bite into a piece, and it should have a good flavor. Mozzarella browns or "blisters" very easily in the heat of the oven. This cheese has exactly the right combination of oil and water for perfect browning according to Dr. Bryony James at the University of Auckland. The oven's heat makes the water in the cheese boil. Oil in the cheese starts to leak out on the surface, and the steam creates bubbles. As the bubbles break through the oil, they brown. When a cheese has too much oil, the bubbles never break through that layer and do not brown. Does Subway Have a Gluten-Free Menu? Mozzarella is the classic cheese used on most pizzas, but there are rules about the type to use. It is very elastic, which means you'll get a nice "cheese pull" when you bite into a slice. It also browns well and forms blisters easily. But there are caveats: not all types of mozzarella will work well. Fresh mozzarella, for instance, contains a lot of water. As this cheese melts on the pizza, it will release the water, making the crust soggy. You can reduce this effect by pressing the fresh cheese between paper towels. Buffalo mozzarella also has a lot of moisture and it is less dense than fresh, but it has more flavor. Low-moisture mozzarella is denser and has more flavor. Part-skim, or skim milk mozzarella, is very elastic but has less flavor. Grate or shred the cheese and sprinkle it evenly over the pizza for best results. If you can find little balls of mozzarella, called "bocconcini," just place them on the pizza. Many pizza recipes call for using two or more types of cheese. 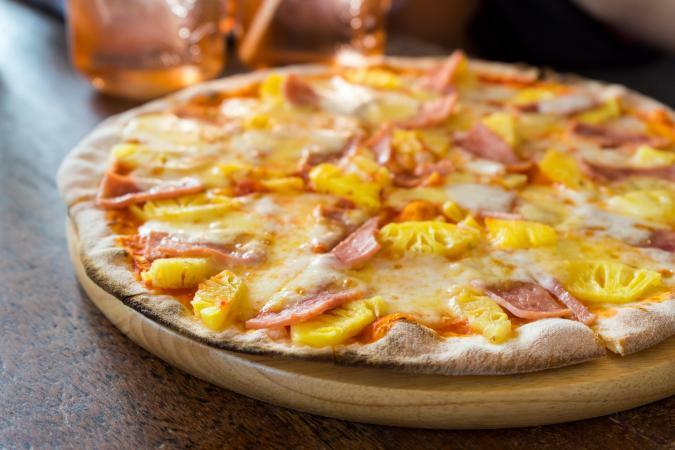 These additions add flavor and color to the pizza, while maintaining the desired elasticity and browning and blistering. Cheddar, Monterey Jack, Colby, and Swiss cheeses brown less and more evenly than mozzarella because they release more oil, giving you the ability to control the amount of browning and blistering on your pizza. None of these cheeses have the same elasticity as mozzarella. It's important to use natural cheese on your pizza for best results. Processed cheeses have emulsifiers, food coloring, and other artificial ingredients. These cheeses melt well, but are very mild in flavor, aren't elastic, and will not form blisters in the heat of the oven. Some processed cheeses are made of blends of different types. Use these cheeses in addition to part-skim or low-moisture mozzarella for a fabulous pizza. Add most of the cheeses in a 1:1 ratio. For instance, if your recipe calls for 3 cups of shredded or grated cheese, use 1-1/2 cups of mozzarella and add 1-1/2 cups of these cheeses. Use about 1/3 to 1/2 cup of goat cheese, feta, blue cheese, or Parmesan cheese on most pizzas. Cheddar cheese: You can use this type of cheese on pizza for added flavor and color. But it is not as elastic as mozzarella cheese, although it flows well, and doesn't form bubbles that brown easily. The cheese browns evenly over all of its surface. Feta: This sharp tasting cheese will not melt much or flow, and it is not at all elastic. It browns slightly and adds great flavor to pizza. Colby cheese: This cheese is a milder version of cheddar. It forms smaller blisters that do not brown because it has low elasticity. American cheese: Not many pizza recipes call for this mild cheese, which is processed and includes emulsifiers and artificial flavors. It melts very well and flows easily, but doesn't brown well and is not elastic. But kids love it! Havarti cheese: This is a fancier type of Swiss cheese, with more flavor. It has a slightly sour note and flows well as it melts. It browns evenly with few blisters. Swiss Cheese: Swiss cheese is not as elastic as mozzarella, but it adds a pronounced flavor to the pizza. It also produces more oil as it melts so browns less than other cheeses. Edam: This cheese does not form blisters, but it's very flavorful. You can buy a smoked version of this cheese for lots of flavor. Remove the red wax covering on the cheese before you shred it. 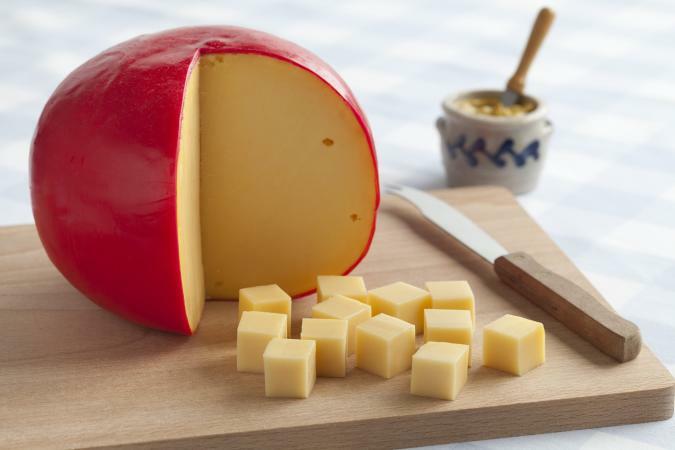 Gouda: Similar to Edam, this cheese doesn't form blisters and produces more oil as it melts. Smoked Gouda is also available for those who prefer a strong taste. Monterey Jack cheese: This semihard cheese melts and flows well but is not very elastic. It browns evenly. Pepper Jack is made with diced jalapeno peppers and is very spicy. Gruyere: This cheese has more oil, so the blisters or bubbles don't break through the oily layer to brown. But it is very flavorful and melts well. Ricotta: There are two types of ricotta cheese: soft cheese and Ricotta Salata, which is hard and crumbly. You can spread the soft ricotta right on the crust and top with mozzarella and provolone to make a white pizza. Fresh ricotta is usually too soft and wet to use all on its own. Ricotta Salata is crumbled on top of the pizza; it won't brown much and just softens instead of melting. Emmental: This cheese has little moisture so it doesn't create much steam as it heats in the oven. This cheese doesn't brown well in the oven, but it melts beautifully. 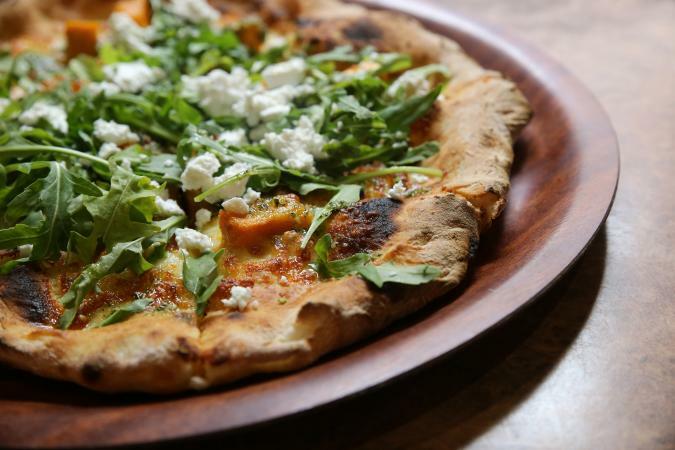 Goat cheese: Goat cheese is crumbled onto pizza, not shredded. It doesn't really melt, but softens and browns. 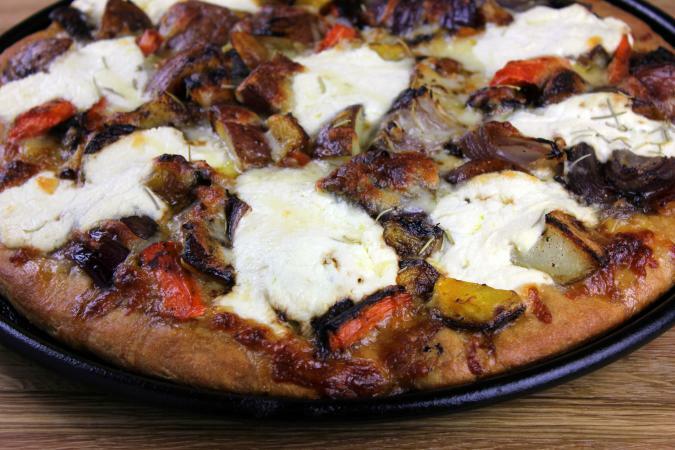 It's good on simple pizzas such as those made with caramelized onions and vegetables. Parmesan: This hard grating cheese does not really melt as much as soften. You can sprinkle some on top of other cheeses for added flavor. 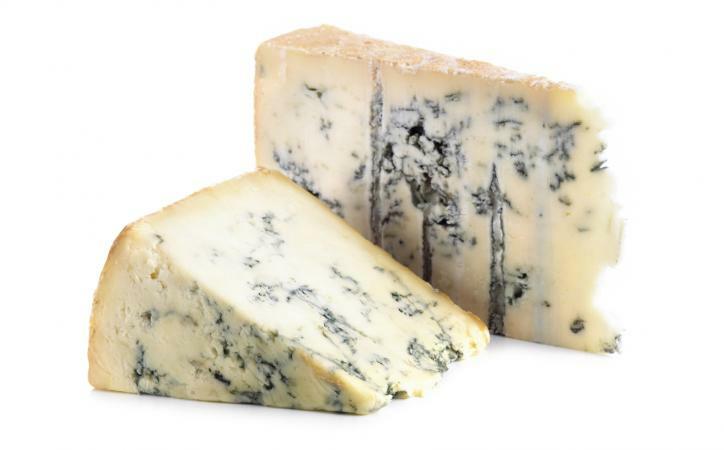 Blue cheese: This cheese will not melt, flow, or brown much, but it adds a ton of flavor. Brie: This cheese browns evenly, and it has a unique flavor and melts to an almost liquid consistency. It's good sliced on pizzas with no sauce. You can remove the rind or leave it on. Provolone: This cheese is similar to mozzarella in moisture content. It browns less than mozzarella, but it bubbles and does have some good elasticity. It has more flavor than mozzarella and produces more oil as it bakes. Vegetarian pizza: Any combination of cheeses is good on this pizza. Cheeses with more flavor, especially Gouda or Cheddar, are really delicious with vegetables, especially those with strong flavors, such as broccoli. White pizza: This pizza is made with white cheeses, typically a 1:1 combination of ricotta and mozzarella, and fresh herbs. Traditional pepperoni pizza: Part-skim mozzarella is the best choice for this traditional pizza. You can add Swiss or Colby for a change of pace. 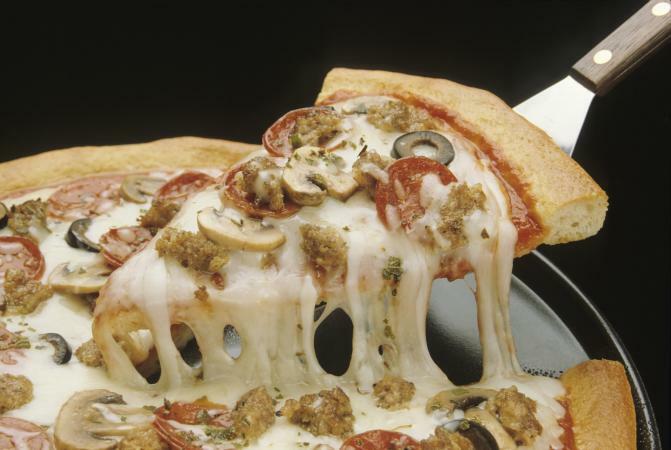 Sausage pizza: Try using a combination of Cheddar and mozzarella on this type. Sprinkle some Parmesan over those cheeses for a finishing touch. 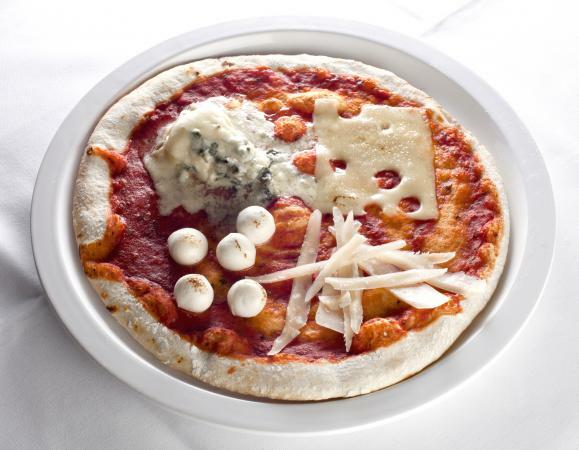 Gourmet pizza: Let your imagination run wild and use any combination of cheeses for a gourmet pizza. Try Brie and Havarti, or provolone and Camembert. Your taste is the only limitation. Sauce is going to add moisture and steam to the cheese. A very saucy pizza should be topped with mozzarella or other low-moisture cheese, since the steam the sauce creates will reduce browning. For pizzas with less sauce, you can use just about any combination of cheeses you'd like. Now that you understand some of the properties of cheeses used on pizza, you can mix and match them for the type of finish you like best. Use more mozzarella for elasticity and nicely browned blisters, or reduce it and add some Swiss, Edam, Gouda, or Cheddar for less browning and more flavor. Use feta, blue cheese, and Parmesan to finish off your creation. And enjoy every bite.